An organic joint of grass-fed roasting beef. 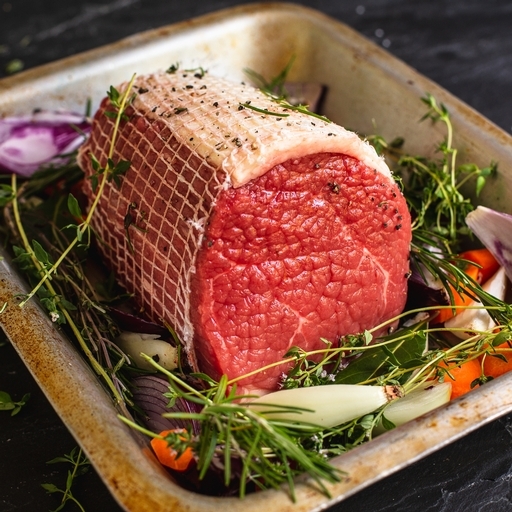 The most popular cut for a Sunday roast – great value, lean and tender. It also works beautifully for pot roasts. Simmer slowly with red wine and seasonal veg, then serve up big bowlfuls of comfort. Serves 4-6. Remove from the fridge 30 mins before roasting. Season and oil generously. Brown in a 220°C/Gas 7 oven for 20 mins, then turn down to 160°C/Gas 3 and add a little water to the pan. Cook for 20 mins per 500g (add/subtract 15 mins for well done/rare). Wrap in foil and leave somewhere warm to rest for at least 15 mins before carving. Use any resting and roasting juices as the base for your gravy.